PLUTONOMY is a word coined five or so years ago by Ajay Kapur, then a global strategist at Citigroup, to describe the United States economy. It is a kinder, gentler synonym for plutocracy or oligarchy. It means an economic system based on serving the needs and desires of the ultra-rich. In the United States, 1 percent of the population has wealth equivalent to the bottom 90 percent. 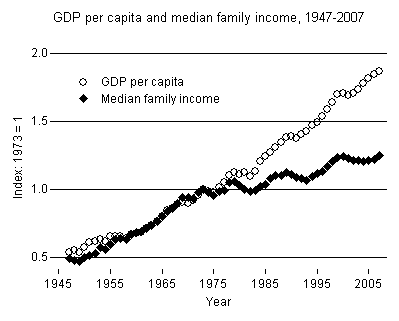 And, according to Kapur, their share of the national wealth is likely to continue to increase. One implication of this fact is that it makes more sense for business to make products for the ultra-rich than for the mass public. He recommended a Plutonomy investment portfolio, in stocks of Tiffany’s, Sotheby’s, Burberry, the Four Seasons and other companies that cater to the wealthy elite. Another is that many of the problems that affect the general public – for example, rising gasoline and food prices – do not affect the Plutonomy. That means little is likely to be done about these problems. After Michael Moore cited Kapur in his documentary movie, “Capitalism: a Love Story,” his writings were taken down from the Internet. But earlier this year Kapur, who now is head of Asian equity strategy for Deutsche Bank, resurfaced with an interview by Robert Frank of the Wall Street Journal. 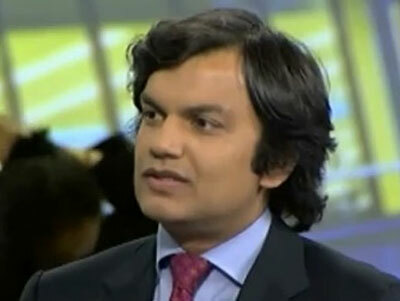 Kapur said the Plutonomy is alive and well, and is so well entrenched it is unlikely to go away anytime soon. In fact, he now sees the whole world, not just the United States, as a Plutonomy. The foundation of Plutonomy is deregulation and low taxes, Kapur said, and the Plutonomy is so politically powerful that it can resist populist pressures for the indefinite future. Unlike me, he has no problem with this. He sees the desire to join the Plutonomy as the driving force of progress. And as for an economy in which most people work to serve the desires and interests of the rich, he has made a good career doing just that. “High net worth individuals” – people with $1 million or more in ready cash to spend – are leaving behind the vast majority of people worldwide, who are treading water or sinking economically, according to a report by Capgemini, a French consulting firm, and Merrill Lynch. High net worth individuals are more numerous and individually wealthy than before the recession. And within this wealthy group, there is an ultra-rich group with $30 million each available to spend. They are 1 percent of high net worth individuals, but they hold more than a third of the total wealth of people in this category. A recent research report by a firm called Digitas, self-described as “the leading global integrated brand agency,” writes off two-thirds of the people even within the $100,000-plus category. 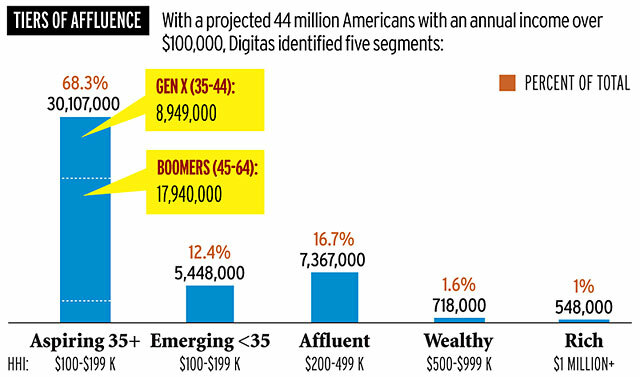 Unless you are taking in $200,000 or more by age 35, you’re not worth bothering about, Digitas says. And if you aren’t taking in $100,000 or more a year in your 20s, you have little chance of reaching the $200,000 level. Digitas recommends that business should concentrate on selling only to the Affluent, Wealthy and Rich, and to the Emerging Affluent, since they have a chance of becoming Affluent, Wealthy or Rich. The rest don’t count. During most of the 20th century, it was a proud boast of the United States that the vast majority of the population had access to the same kinds of goods and services as the very rich. They all could afford similar, though not identical, goods and services – automobiles, refrigerators, TVs, annual vacations at the seashore or in the mountains. You could not tell the difference between a wealthy person and a middle-class or working-class person by looking at them. This is still true to an extent. But unless something changes, we’re moving toward an economy more like that of France in the age of Louis the Fourteenth, in which the vast majority of the population labored at low wages to serve the desires of a wealthy minority. More refugees are fleeing Afghanistan and Iraq than from any other countries. America’s wars continue to account for many of the world’s refugees: 4.7 million originate from Iraq and Afghanistan, almost half the world’s total, according to the UNHCR’s annual report. America also accepts more refugees for permanent settlement than any other country (71,400 in 2010). 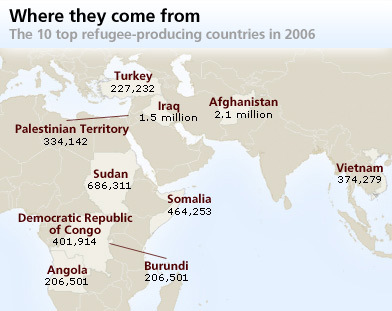 Most refugees, however, end up as temporary residents in neighboring countries. If a conflict or natural disaster is regional, states of origin may also be host states. Hundreds of thousands have fled civil wars in Congo and Sudan, but many seek refuge in both countries too. Tibetans may flee China, but the People’s Republic hosts more refugees than it produces—mostly accounted for by 300,000 Vietnamese long settled in China. The reasons for the refugee flight appear to be different in Afghanistan and Iraq. In Afghanistan, people are mainly fleeing the war itself. Refugee International, a humanitarian organization, said some refugees are fleeing Afghanistan’s corrupt and out-of-control police forces, but many have been driven from their homes by air strikes and Special Forces raids. In Iraq, as the war winds down, refugees flee mainly sectarian violence by Sunni and Shiite Muslims. Many members of Iraq’s centuries-old Christian population, which dates back to before the coming of Islam, have fled. This is something new. Saddam Hussein was a cruel tyrant, but he did not single out Christians for persecution. The use of the word “crusade” by Americans is just as broad. When we Americans use the word “crusade,” we mean a fight for good against evil. Movements for social reform or religious revival are called crusades. A “crusading reporter” has a mission to expose corruption and social evils. General Eisenhower’s memoir of the Second World War was entitled Crusade in Europe. We Americans like to think of our wars as crusades, as righteous struggles to eliminate evil. We are reluctant to go to war unless it is a crusade, and we don’t have any staying power unless we convince ourselves we are in a crusade. We don’t like to think that our government wages war out of economic self-interest or for geopolitical advantage, just like other governments, and we become cynical and angry when we find out that it does. We were told our Revolutionary War was a crusade against the tyranny of King George III. We were told the Mexican War was a crusade to extend American freedom from sea to shining sea. We were told our Civil War was – on both sides – a crusade against the enemies of American freedom. We were told that the Spanish-American War was a crusade to liberate the Cubans and Filipinos from the tyranny of Spain. We were told American intervention in the First World War was a crusade to make the world safe for democracy against the threat of Kaiser Wilhelm’s despotism. Disillusionment held us back from crusading against Nazi Germany – rather the Germans declared war on us. But Hitler really was as evil as our government’s propaganda said he was. The Allies may not have been morally pure, and the Second World War may not have made the world safe for democracy, but we look back on that war as a good war, a war that saved the world from totalitarian barbarism. After the Second World War came the Cold War. Stalin arguably was as evil, or nearly as evil, as Hitler, but it was hard to present the Cold War as a crusade because, unlike the Second War War, its aim was only to create a barrier evil, not to eradicate it. American interventions in Korea and Vietnam quickly became unpopular because they were not crusades. They did not promise an end to evil. Nations with an aristocratic tradition regard war as a normal activity. The purpose of a hereditary aristocracy, after all, is to breed people trained from birth for fighting and military leadership. They don’t require high moral justifications for war. But we Americans don’t like to face the fact that we go to war for economic, geopolitical and other morally impure reasons. During the 1991 Gulf War, President George H.W. 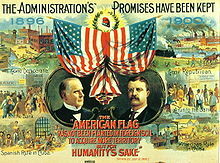 Bush said it was about “jobs, jobs, jobs” – meaning that the U.S. economy required us to control the oil of the Persian Gulf. This explanation met with indifference, and we soon were told that Saddam Hussein was equivalent to Hitler. This video shows a 10-day meeting in the Swiss Alps of shamans, medicine people and other spiritual leaders of indigenous peoples from around the world. Although their cultures originated in isolation from each other, they found common ground, and had much to say to each other. I found this video very interesting. I am not sure what I think of it. I am glad that primal religions and indigenous cultures exist. I do not think of them as primitive. They are the heirs of as many generations of human existence as is our Western civilization and all the other civilizations. It is reassuring to know that if our modern, scientific civilizations self-destructs, the seeds of other cultures exist from which human society can be regenerated. I believe that these shamans are in better touch with the realities of life, including the inevitability of suffering, old age and death, than many of us so-called modern, enlightened people. 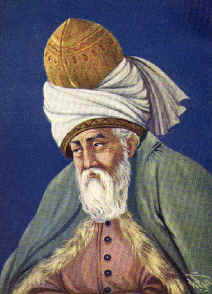 But I have no desire to change places with them, nor do I wish to embrace their religion nor renounce modern culture. All the indigenous cultures are under pressure from the global economy’s hollow commercial culture. Yet without globalization, the shamans would not have been able to share their wisdom with each other. Such is the mixed nature of the modern world. 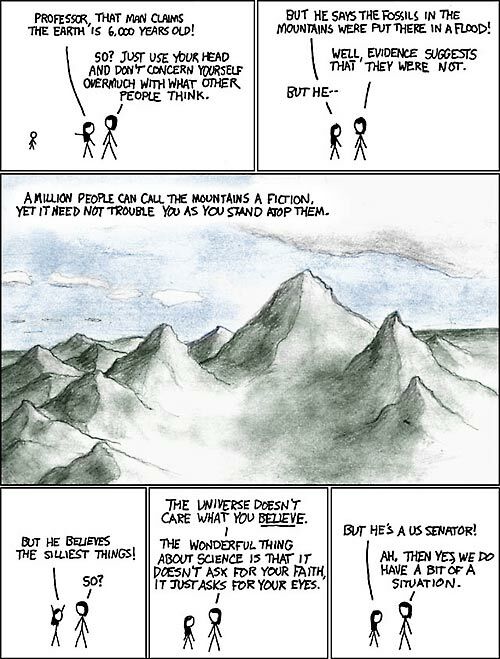 Click on xkcd for more like this. More than 1 million Americans lost their homes last year to mortgage foreclosures, the largest number on record. While the number of new foreclosures has fallen off in recent months, the foreclosure crisis is not over. A large fraction of these are due to financial misconduct by banks and other lenders. I believe this will turn out to be one of the greatest scandals in American history, much more serious than the Teapot Dome and Credit Mobilier scandals of the Harding and Grant administrations. At first glance, the foreclosure crisis seems like merely a case of bad judgment all around – borrowers who shouldn’t have taken out loans, lenders who shouldn’t have granted them. There is a problem with paperwork showing who holds the mortgages, but at first glance this seems like a case of negligent record-keeping. And if banks sometimes foreclose on people who are current with their payments, or who don’t even hold mortgages, these cases are aberrations. Not necessarily so! Some people who are current with their mortgage payments are being thrown into default without their knowledge. Here’s how it works. You send in your mortgage payment, but somehow it is put down as being late. Maybe it’s your fault, maybe it is bank’s fault, maybe it is the fault of slow mail delivery, in some cases it wasn’t late at all and the bank is charging a fraudulent fee – but you are charged a penalty. However, you are not told about the penalty, and so you unknowingly are in default for that amount on your next mortgage payment. Next time you owe the amount you missed plus interest. This keeps mounting up. You may not find out until foreclosure proceedings begin, or until the amount is too much to pay. How would it benefit a bank to do this? Well, as with credit cards, the fees and penalties can be as lucrative as the debt repayment itself. Then there are people who have had a run of bad luck – big medical bills, or loss of a job – who may miss a payment or be late on a payment, but are good for the money in the long run. In an earlier era, such people would have a good chance of working something out with their local banks. But now, the right to the income from the mortgage has been sold to some investment trust, possibly in a foreign country. If you miss a payment, the bank is still liable to pay off the trust. Only by foreclosing can the bank get out of its obligation. Then there is the matter of bad records. Each time a mortgage or a claim on mortgage payments is transferred, state laws require verification that the person selling the mortgage or claim actually owns it. In many cases, this has not been done. 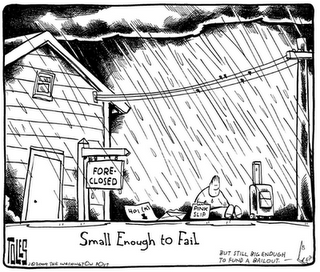 Sometimes this is a result of false economy – refusing to pay the money needed to do the job right. But in the case of the securitized subprime mortgages, obfuscation of the records has the benefit of preventing the buyers of the securities from being able to find out they have purchased a toxic asset. The largest banks have outsourced foreclosure to service companies, who are paid based on the number of foreclosures they process. The service companies have no interest in checking whether the foreclosure is legally valid, and, for that reason, people who are paid-up on their mortgages, or who don’t even owe anything, have been had their properties put up for foreclosure auctions. President Barack Obama last night announced a plan to reduce the number of U.S. troops in Afghanistan from more than 100,000 to between 60,000 and 70,000. But the United States will still be making a stronger war effort than under President George W. Bush. When left office, U.S. troop strength in Afghanistan was under 40,000. What Obama is doing is not a reversal of policy. His position in 2008, like Senator Kerry’s in 2004, was that, by invading Iraq, the United States was fighting the wrong war, and that the U.S. government should be shifting its forces from Iraq to Afghanistan. Obama is doing what he said was going to do—unfortunately. How different is Obama from Bush? Back in early 2008, I liked to joke that in order to get my vote, a Presidential candidate would have to be a carbon-based bipedal life form who was not George W. Bush. I voted for Barack Obama, but I am having a hard time seeing differences between his administration from what a third-term George W. Bush would have done? Not everything George W. Bush did was bad, and I don’t say that President Obama has to be the opposite of Bush in all respects. But what I hoped was that he would bring an end to abuse of power and restore the rule of law. I hoped that if he could not be another Franklin Roosevelt or John F. Kennedy, he would at least be another Gerald Ford or Jimmy Carter – decent moderate leaders who obeyed the law and the Constitution. This was not to be. George W. Bush got Congressional approval for war against Iraq under false pretenses. Barack Obama is taking the United States into war with Libya without even asking for Congressional approval. Under George W. Bush, the United States created an archipelago of secret torture centers; like the gulag archipelago described by Alexander Solzhenitsyn, it is a secret world unto itself. Barack Obama has continued these torture centers, while making a half-hearted gesture toward closing the one at Guantanamo Bay. A number of Presidents, going back to John F. Kennedy, secretly plotted the assassination of foreign leaders; President Obama openly claims the right to sign death warrants for anyone he deems a terrorist. 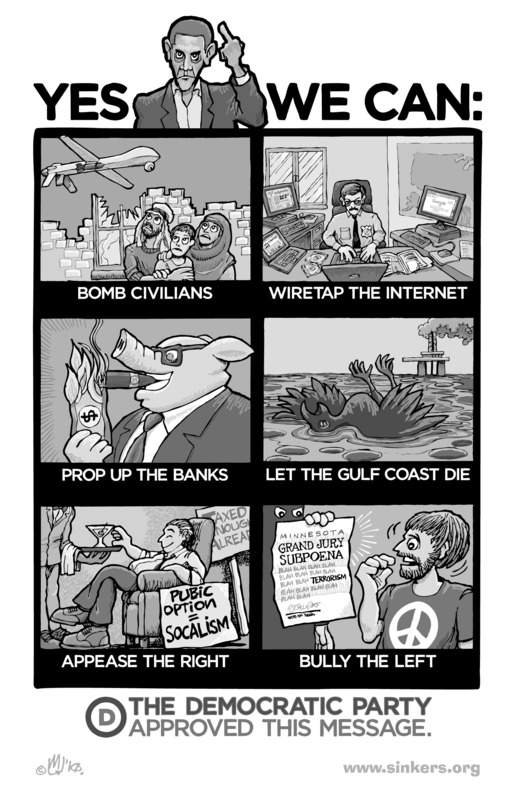 What is a terrorist? It is whoever Obama says is a terrorist. Somebody in the Defense Department wrote a memo saying anti-war activity is low-level terrorism. The Obama administration is prosecuting a whistleblower for revealing waste and mismanagement in the National Security Agency. I have always been proud that the United States did not have any equivalent to Britain’s Official Secrets Act, a law dating from World War One which essentially gives the British government the power to prosecute anybody who reveals anything that the government wishes to keep secret. Now the Obama administration interprets the U.S. Espionage Act, dating from the same period, as giving it the same authority. About 40 percent of the U.S. corn crop is diverted to make ethanol additives to gasoline. In a time of rising food prices, this doesn’t make sense. Last week the U.S. Senate voted 73-27 to end the government’s 45 cents a gallon tax credit to ethanol refiners and its 54 cents a gallon tariff on imported ethanol. Ethanol subsidies, first enacted in 1978, cost the federal government $6 billion a year. Was the Senate’s vote a step to a more rational policy? Maybe and maybe not. In a way, the vote was play-acting. The amendment is highly unlikely to become law. The vote was on an amendment to a bill that may not pass the Senate, and, even if it survives, it is not expected to pass the House of Representatives. President Obama favors ethanol subsidies as part of his biofuels program, and is expected to veto the bill even if it passes. And even if it did become law, it wouldn’t change the federal mandates requiring use of ethanol in fuel. In fact, the Environmental Protection Agency plans to increase the ethanol content of gasoline. No, that doesn’t make sense to me, either. But the amendment, which had broad bi-partisan support, is important because it recognizes that tax breaks are equivalent to other subsidies. If you lower the taxes of ethanol producers by $6 billion, and leave everything else the same, that $6 billion has to be made up by taxes on somebody else – either on you and me, or, if financed by deficit spending, on future generations. Recognition of that fact by conservative Republicans is an important step forward, as is the willingness to question ethanol subsidies. Many Republicans have been afraid to go against the influential Americans for Tax Reform. Its president, Grover Norquist, asks them to sign a pledge promising not to raise income taxes and not to eliminate any special tax break without offsetting it by a cut in general tax rates. The Senate vote represents a violation of that pledge – a completely justified violation, in my opinion. It will be interesting to see the political consequences. Hat tip to Sandra Ebersole. Will Vermont show the way on health care? Health care reformers now look to the state of Vermont rather than the federal government to lead the way on the way to a universal public health insurance system. Vermont Gov. Peter Shumlin in May signed into law a bill which commits the state of Vermont to set up a publicly-funded, publicly-administered health insurance system that would cover all 622,000 residents of the state. More than 5 percent of Vermonters are without health insurance, and another 15 percent are considered under-insured. Health care costs in Vermont are rising at the rate of 9 percent a year, twice the rate of the state’s economic growth. Shumlin and other reformers say the new plan will give everyone the coverage they need, and at less cost than the present system. Under the law, a five-member board will be appointed in October to set up a plan called Green Mountain Care. The first step will be for Vermont to set up a health insurance exchange to provide a simplified health insurance marketplace as called for under the federal Affordable Care Act. Starting in 2014, the public would have a choice between the new Green Mountain Care system and at least one private system. The goal is to go to a single-payer system by 2017. There are a lot of things yet to be worked out – in particular, how to pay for the system, and how much health care providers will be paid. The original idea was a payroll tax variously estimated at 12.5 percent or 14 percent, most of it, in theory, paid by the employer. This is a lot! While many people pay an even higher percentage of their incomes for private health insurance, that is still a lot of money. The board’s mandate is to set up a system that will (1) not have a negative effect on Vermont’s economy, (2) have a sustainable system of financing, (3) cost less to administer than the present system, (4) reduce the rate of growth in per-person health care spending, and (5) reimburse health care providers at a sufficient rate that doctors, nurses and other health care workers will not leave the state. Vermont’s health care reformers think that it actually is feasible to provide better health care at less cost. One way to do this is by means of preventive care – helping people to stay healthy so they won’t need a lot of medical treatments. Under the new law, the board will look into capitation, a system of paying health care providers a set amount per patient rather than fee for each service provided. Under a fee-for-service system, the financial incentive is to maximize visits to clinics and doctor’s offices; under a capitation system, the incentive is to minimize the need for visits. Another way health care costs would be kept down is that a public system would not have to pay actuaries to determine the individual risk and premium level for each person, nor set aside an amount as profit for the owners. You might wonder whether this is realistic. In fact, a number of foreign countries provide more extensive health insurance coverage than in the United States and at less cost through just these methods. Actually, two minutes and 15 seconds. Robert Reich was Secretary of Labor under the Clinton administration, and is now professor of public policy at the University of California at Berkeley. Click on Robert Reich for his web log. Hat tip to David Damico for the video. I take back what I wrote about Tim Pawlenty being one of the relatively sane Republican candidates. Here’s what he said in a recent speech. I propose just two rates, 10% and 25%…..A one-third cut in the bottom rate….And a 28% cut in the top rate to spur investment and job creation. In addition, we should eliminate all together the capital gains tax, interest income tax, dividends tax and the death tax. ….Once we unleash the creative energy of America’s businesses, families and individuals as we did in the eighties and nineties, a booming job market will reduce demand for government assistance. And rising incomes will increase federal revenues….5% economic growth over 10 years would generate 3.8 trillion dollars in new tax revenues. Notice how he favors those who get their income from owning financial assets over those who get their income from work. Back in the late 1970s and early 1980s, it was plausible to think that cutting taxes for corporations and extremely wealthy individuals might generate investment and economic growth that would benefit everyone. But this has been tried for 30 years, and it hasn’t worked. Furthermore there never has been a 10-year period since World War Two in which the United States enjoyed 5 percent annual economic growth. Such rates of growth are possible only to countries such as China which start from a low economic base. The economist John Maynard Keynes favored governments running budget deficits when times were bad in order to stimulate the economy. But he also favored running budget surpluses when times were good. If you refuse to pay the normal expenditures of government in good times and bad, you’re not saving the taxpayers any money. They’ll have to pay eventually – and with interest! 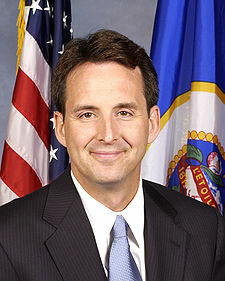 Pawlenty also proposes raising the Social Security retirement age, repeal of the new health care reform and financial regulation laws, gutting the Environmental Protection Agency, eliminating all federal regulations not specifically authorized by Congress and shutting down the U.S. Postal Service. When will Medicare become insolvent? 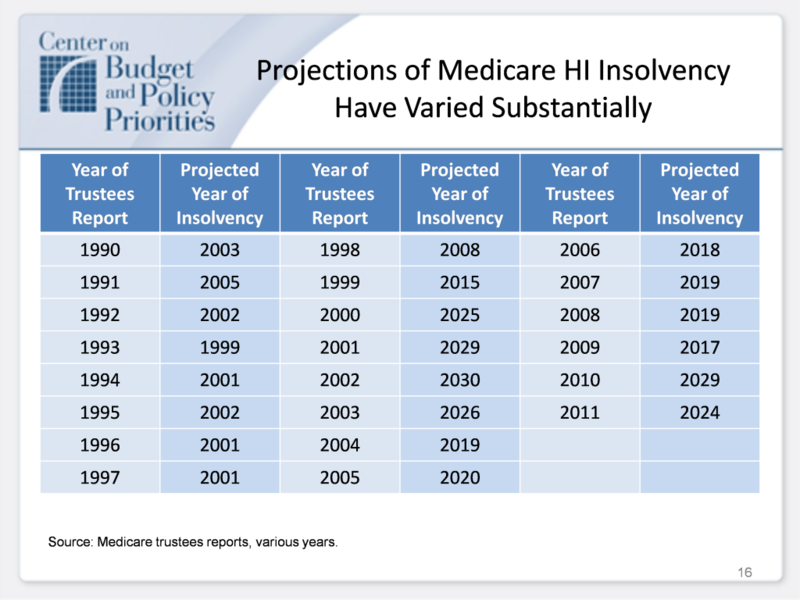 When will Medicare become insolvent? Pick a number from the chart below. In 1991, the Medicare trustees predicted the fund would run short by 1999. The latest prediction is that will be be okay until 2024. Now, the failure of dire predictions to come true doesn’t mean they never will. The ending of the story of the boy who cried “wolf” was that, one day, the wolf really came. But remember that “insolvent” does not mean “broke.” It means that, at some future date which we cannot predict, Medicare will not be able to pay 100 percent of promised benefits unless a change is made in the meantime. We’re not as innovative as we think we are, according to Tyler Cowen, a respected right-of-center on the faculty of George Mason University. American innovation and American income growth are both slowing down, he said in a talk to a TED conference. The great age of American innovation was the first half of the 20th century, not the second half, Cowen said. During the early 20th century, electricity, the telephone, the automobile, broadcasting and aviation revolutionized American life. Nuclear power, the space program, xerography, the personal computer, the Internet, the cell phone – these changed American life much less. I think what he said is correct. I could, without much discomfort, go back to living as I did in 1961. I don’t think many Americans who were 74 in 1961 would have willingly gone back to living as they did in 1911. Cowen said 20th century American innovation was based largely on inventions and discoveries of the late 19th century – the electrical generator and the internal combustion engine. Most of what came after is based on a realization of the possibilities in these two things. The main exception that comes to mind is antibiotics, also an innovation of the early 20th century. But Cowen does not really address the question of why this is so, and nor does he connect it with the slowing of income growth. Under the Obama administration, the decline in U.S. jobs slowed and then reversed. But growth in jobs falls short of what is needed. 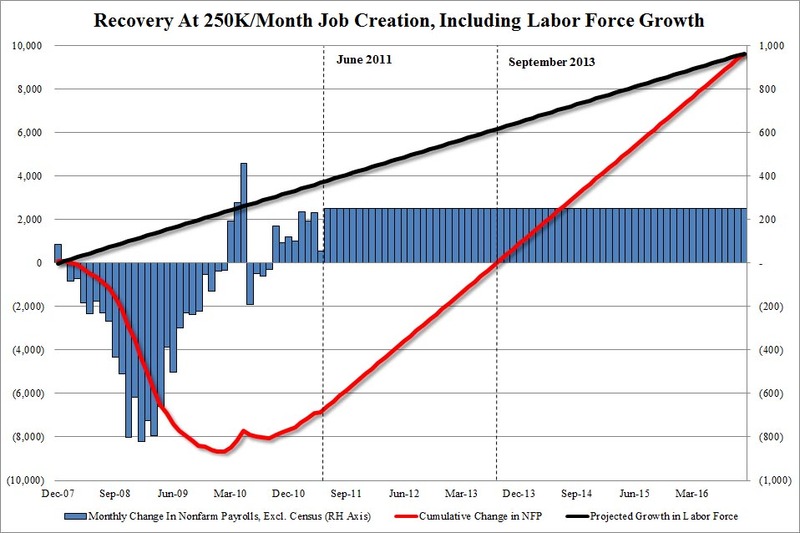 As the chart (taken from the Zero Hedge web log), the United States would have to add 250,000 jobs a month just to get employment back to 2007 levels by election day 2012, and to catch up with the growth in the labor force by election day 2016. The chances of this happening are small. The federal government’s economic stimulus program is coming to an end, while state and local governments continue to lay off employees and cut back program. The state and local economic depressant offsets the federal economic stimulus. The economic slowdown in China, financial problems in Europe, the destruction caused by extreme weather, the continued decline in house prices, the continuing foreclosure crisis, the growing burden of student debt – all are brakes on the U.S. economy. Because the economy was over-stimulated going into the recession, historic methods of economic stimulation haven’t had their expected effect. I think the federal government should put people to work directly. You say we can’t afford it? There are nearly 14 million people who are willing and able to work, but are unable to find jobs, while there is an enormous amount of work that needs to be done. Can we afford to waste their ability? 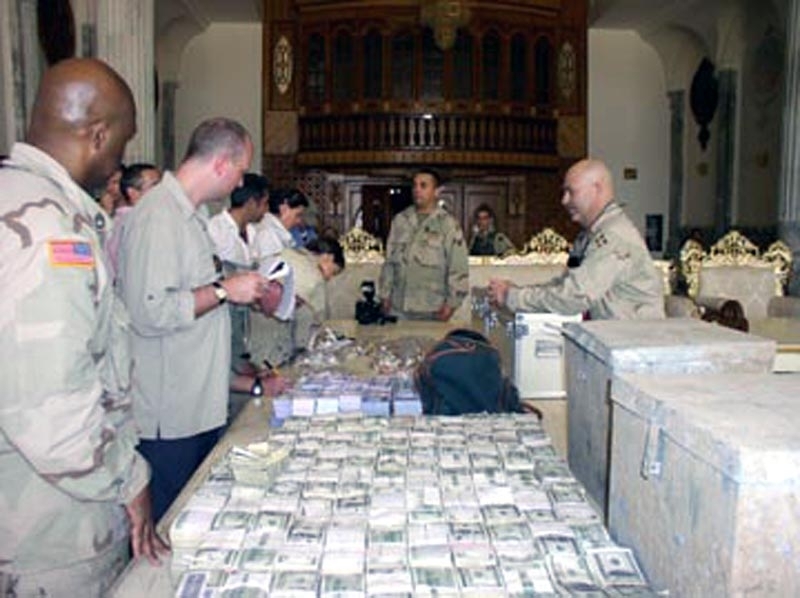 The Los Angeles Times reported that the U.S. Defense Department officials still can’t account for $6.6 billion in Iraq reconstruction funds – some of it distributed in shrink-wrapped pallets of $100 bills. Some or all of it may have been stolen, the Pentagon says. It wasn’t American money. The $6.6 billion came out of Iraq oil sales, seized Iraqi assets and surplus funds from the United Nations oil-for-food program, and not from the $61 billion appropriated by Congress for Iraq reconstruction. After the U.S.-led invasion of Iraq in March 2003, the George W. Bush administration flooded the conquered country with so much cash to pay for reconstruction and other projects in the first year that a new unit of measurement was born. The excuse for the haste was the urgency of getting reconstruction started. The excuse might have some merit if reconstruction had actually taken place. Rep. Henry A. Waxman of California, the senior Democrat on the House Government Reform Committee, deserves credit for his perseverance in investigating this scandal. But I think it is safe to predict that no individual is going to be held accountable, and nobody’s career will suffer. When President Obama told Republican leaders that taxes are lower now than they were under President Reagan, they rolled their eyes as if he were crazy. But in fact, it is true. Balancing the budget and ending the deficit is supposedly the nation’s highest priority. How can you do this if taxes are at the lowest level within memory of most living people? Even tax breaks for special interest are out-of-bounds for discussion. I don’t like paying taxes any better than the next person. But if we need to pay higher taxes to maintain essential government services, I’m willing to do my share. I’d rather pay a modest increase in taxes than cut back schools, libraries, school lunches, medical care for poor people, highway maintenance, and everything else that has to be done to keep taxes abnormally low. And I’d certainly rather increase taxes moderately on the super-rich than voucherize Medicare or privatize Social Security. There is, of course, a better way to increase revenues. That is to re-create the kind of full employment economy that existed in the 1950s and 1960s, and move people from being tax consumers to tax payers. Click on Ten Charts that Prove the United States is a Low Tax Country for a summary of the facts by the Center for American Progress. Some of the charts are below. 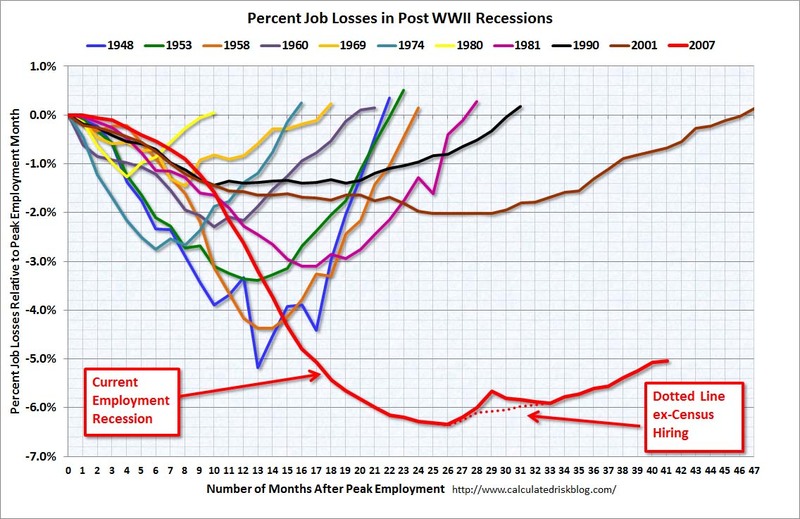 Current job losses exceed any other post-war recession. Click to view. This recession is not like other recessions. By every measure, the downturn is the worst since the Great Depressions of the 1930s. Stimulus programs that might have worked in earlier downturns are not working now. That is because the current recession is not just part of a normal economic cycle. It is a day of reckoning for 30 years of trying to run the U.S. economy on debt instead of production. The great economist John Maynard Keynes had a prescription for recessions which is somewhat like Joseph’s advice to Pharaoh in the Bible. Joseph advised the ruler of Egypt to store up grain during the fat years so it would be available to the people during lean years. Keynes advised the rulers of the United Kingdom and the United States to run budget surpluses and tight money during the expansionary years, and stimulate the economy by pumping money into the system during deficit years. However, if you are stimulating the economy all the time, which was what was done during the George W. Bush administration, then you have nothing left to do when times turn bad. When the economy is over-stimulated already, the traditional economic stimulus doesn’t work. Historically, when people have more money in their pockets, they spent some of it. Now sensible people will try to pay down their debts. President Barack Obama is no worse than Presidents Ronald Reagan, George H.W. Bush, Bill Clinton or George W. Bush, who all were happy to go along with financialization and de-industrialization, but more is required of him than was required of the others. So far President Obama has done good things. He organized a well-thought-out effort to keep General Motors Corp. for failure, which would have been devastating to the industrial Midwest. He has directed money to fostering green industry, which may have a good payoff in the future. 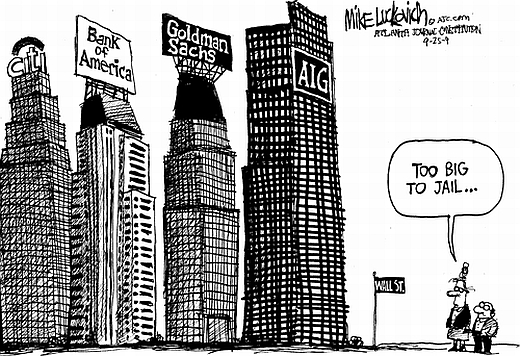 But his main effort seems to be to put Wall Street and the banking industry back the way they were before. But the way things were before is not sustainable. Inflating another financial bubble is not the answer. It may not even be possible. Rebuilding the U.S. economy will be a long, slow process, if it is possible at all. I hate to think that the hollowing out of American industry has reached the point of no return, but there is such a point. The first step is for our leaders – and this goes for Mitch McConnell, John Boehner and Mitt Romney as well as Barack Obama, Harry Reid and Nancy Pelosi – to make an effort to understand the situation instead of score points off each other, and the second step is to tell the American people the reality of our situation.